Mountain areas of the world are attracting increased attention as observations and climate model simulations indicate that these regions will be greatly impacted by global climate change and are early warning indicators of future impacts worldwide. 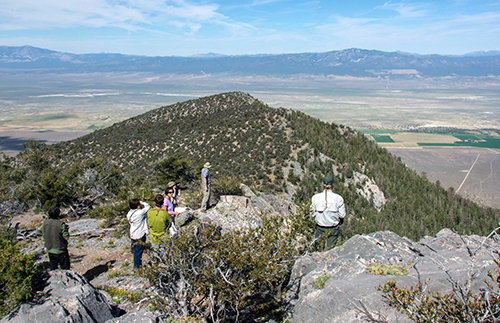 Mountain ecosystems of the western United States are complex, and include cold desert biomes, alpine biomes, and tundra ecosystems occurring above timberline. The alpine ecosystem within the cordilleran region that extends into Central America is the only one that exists in all different climatic zones from the equator to the polar region. This environment is among the most sensitive to climatic changes occurring on a global scale, comprising glaciers, snow, permafrost, water, and the uppermost limits of vegetation and other complex life forms. The stratified, elevationally-controlled vegetation belts found on mountain slopes represent an analogue to the different latitudinally-controlled climatic zones, but these condensed vertical gradients are known to support unique hotspots of biodiversity. High relief and high gradients make mountain ecosystems especially vulnerable to slight changes of temperatures and to extreme precipitation events. In effect, mountains have become the proverbial “canary in the coal mine” in terms of their sensitivity to climate and other environmental changes, yet their critical importance and vulnerability are often overlooked. When mountains change society feels the impact. Mountains are complex social-ecological systems that influence people's lives through the ecosystem services they provide (e.g., fresh water, hydroelectricity, habitat). Relatively small perturbations in global processes can cascade to large changes in the mountainous regions of western North America, which in turn affect the socioeconomic well being of this region and the nation at large. A number of academic, agency, and NGO efforts are underway to develop regional-scale integrated climate research efforts and enable the monitoring activities to support them. Such efforts are justified by the importance of mountain environments and ecosystem services to society, the sensitivity of mountain ecosystems to climate change, and the rapid response of these regions to small changes in atmospheric conditions. In 2004 an inaugural conference on mountain climate was held at Lake Tahoe. The meeting was attended by a broad cross-section of scientists, agency representatives, and university researchers from across the US and abroad. The quality and diversity of the science discussed at that meeting convinced participants that a biannual meeting should be established that is dedicated to mountain climate sciences and effects of climate variability on ecosystems, natural resources, and conservation in western North American mountains. 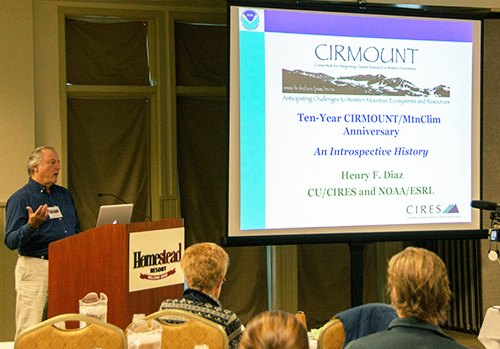 Every even-numbered year since that initial meeting has seen a MtnClim conference featuring invited and contributed talks, poster sessions, and working-group sessions on various aspects of mountain climate science including hydrology, ecology, and glaciology. Every MtnClim meeting also includes post-conference workshops for natural-resource managers to address the management implications of climate variability and climate change in conservation and resource management. To encourage discussion and interaction, we have capped attendance at 120 participants, and conferees represent an array of agency and academic backgrounds and disciplinary fields. More information on previous conferences is available here: http://www.cirmount.org/meetings/mtnclim.shtml. Post-conference Resource-Managers’ Forums: a focused discussion between scientists and resource managers on emerging issues and adaptive management options.